How did the Good Dude celebrate March Madness? With the Good Dude Bracket Challenge. 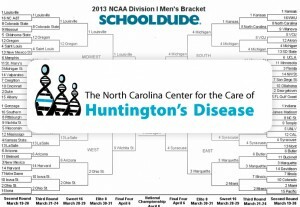 The Good Dude philanthropy program hosted a bracket challenge this year. All proceeds went to the charity of the winner’s choice and SchoolDude even matched the winnings! This year’s March Madness event enabled SchoolDude employees to exercise their competitive spirit for a great cause. This year’s winner was Meg Mirabito. She works on SchoolDude’s client services team ensuring SchoolDude clients utilize their applications to the fullest extent and improve operations and productivity at their schools. For her victory, she received the coveted Golden Bracket Challenge Trophy to display in her office for a year. Additionally (and more importantly), a $470 donation will be made to North Carolina-Center for the Care of Huntington’s Disease, a charity close to Meg’s heart. The Good Dude hosts events throughout the year, donating our time, technology and funds to support our community, education sector and those in need. Learn more about the Good Dude’s events and how you can be involved.